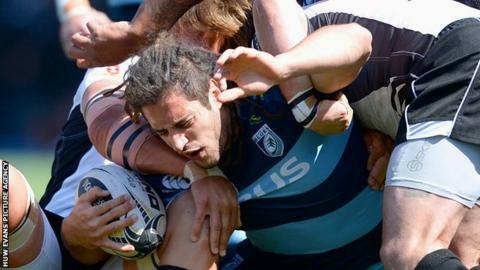 Back-row Josh Navidi has signed a new contract with Cardiff Blues that will keep him at Cardiff Arms Park until at least 2019. The 24-year-old's previous deal was set to run until the end of the 2015-16 season. "I am thrilled to sign the new extension ahead of the new season and commit to Cardiff Blues," Navidi said. "I've come through the system at the region and this is where I want to play my rugby." Navidi made his senior Blues debut in 2009 against Leinster and is closing in on a century of appearances for the Welsh region. The Bridgend-born forward captained Wales at Under-20 level and made his senior international debut in 2013 against Japan in Tokyo. Navidi was named Cardiff Blues player of the year for the second season running at the end of the last campaign, having scored seven tries in 27 appearances. Blues head coach Danny Wilson said: "We are delighted that Josh has signed a new long-term contract extension that will ensure he is a key part of our region going forward for many years to come. "Josh leads by example in the manner in which he performs every time he steps out on the field for Cardiff Blues. "He is an outstanding professional within our squad who young players can aspire towards. "Josh's playing future would have undoubtedly have created interest both home and aboard. "But he is a local boy who wants to play his rugby here, has come through our system and has shown his desire to be a part of what we are building here by signing a new deal." Blues begin their 2015-16 Pro12 campaign on home soil against Zebre on 6 September.